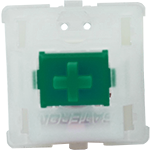 Similar in feel to Cherry MX Greens, Gateron is a Cherry Clone with a feel that more than holds its own with Cherry. It has a crisp, consistent sound that is slightly quieter than the Cherry Green. I used Gateron Greens for my numpad. This switch has a loud click and heavy feel that I like. Have experience using Gateron Green switches? Add a review to share your knowledge with the keyboard community.